Many dentists recommend xylitol-sweetened gum because several experiments have suggested that xylitol prevents tooth decay. Individuals have been trying to refrain from too much added sugar in recent years. Sugar-free chewing gum, candy, mint, and oral care companies have looked to natural alternatives to respond to the negative connotation of unhealthy effects that go with added sugars. In such a scenario, one of the most commonly used natural alternatives is xylitol. You might ask, what is xylitol? Xylitol is a sugar alcohol that looks and tastes like table sugar, but has fewer calories and does not raise blood sugar levels. Xylitol has a similar sweetness to table sugar, but 40% fewer calories. Every gram of table sugar contains four calories, while one gram of xylitol contains 2.3 calories. This naturally-occurring compound can be found in small amounts in many fruits and vegetables. In addition, the human body processes small quantities of it through normal metabolism. One of the appealing reasons to use xylitol is the low glycemic index score. Eating pure sugar can spike the blood sugar and insulin levels. On the glycemic index scale, table sugar has a score of 60-70 while xylitol has a rating of only seven. A low glycemic score means that the food product does not spike and crash blood sugar levels. Xylitol is an excellent natural alternative to sugar for individuals with diabetes, pre-diabetes, obesity, or other metabolic problems. Animal studies showed that xylitol could improve symptoms of diabetes, reduce belly fat, and prevent weight gain. Research published in the Annals of Nutrition and Metabolism studied the health effects of xylitol. They found that food and fluid intake, body weight, blood glucose, and serum lipids significantly decreased and serum insulin concentration and glucose tolerance ability greatly increased when rats consumed xylitol instead of table sugar. Those who want to improved oral and dental hygiene can look to xylitol, as it can kill the bad bacteria in the mouth. Many dentists recommend xylitol-sweetened gum because several experiments have suggested that xylitol prevents tooth decay. Research from the University of Lund revealed that though oral bacteria feed on table sugar from food, they cannot use xylitol. Replacing table sugar with xylitol, therefore, reduces the available fuel for the harmful bacteria. This starves the bacteria and can reduce levels of harmful bacteria by 27-75%, while having no effect on friendly bacteria in some studies. A myriad of studies show that xylitol can reduce cavities by as much as 85%. Xylitol consumption increases the production of saliva, reduces the acidity of saliva, and slows down the degradation of tooth enamel. Saliva contains calcium and phosphate, which is reinserted into the teeth and aid in re-mineralization. Most people can eat xylitol candy or chew xylitol gum, but some people do experience digestive side effects such as gas, bloating, and diarrhea. Dr. Maklinen found that people who consumed an average of 3.3 pounds of xylitol per month, with a maximum intake of 400 grams per day, experienced no adverse effects. Amo, K., Arai, H., Uebanso, T., Fukaya, M., Koganei, M., Sasaki, H., ... & Takeda, E. (2011). Effects of xylitol on metabolic parameters and visceral fat accumulation. Journal of clinical biochemistry and nutrition, 49(1), 1. Bahador, A., Lesan, S., & Kashi, N. (2012). Effect of xylitol on cariogenic and beneficial oral streptococci: a randomized, double-blind crossover trial. Iranian journal of microbiology, 4(2), 75. Edwardsson, S., Birkhed, D., & Mejàre, B. (1977). Acid production from Lycasin®, maltitol, sorbitol and xylitol by oral streptococci and lactobacilli. Acta Odontologica, 35(5), 257-263. Hämäläinen, M. M., Mäkinen, K. K., Parviainen, M. T., & Koskinen, T. (1984). Peroral xylitol increases intestinal calcium absorption in the rat independently of vitamin D action. Mineral and electrolyte metabolism, 11(3), 178-181. Islam, M. S. (2011). Effects of xylitol as a sugar substitute on diabetes-related parameters in nondiabetic rats. Journal of medicinal food, 14(5), 505-511. Islam, M. S., & Indrajit, M. (2012). Effects of Xylitol on Blood Glucose, Glucose Tolerance, Serum Insulin and Lipid Profile in a Type 2 Diabetes Model of Rats.Annals of Nutrition and Metabolism, 61(1), 57-64. Mäkinen, K. K. (1975). Long-term tolerance of healthy human subjects to high amounts of xylitol and fructose: general and biochemical findings. Internationale Zeitschrift fur Vitamin-und Ernahrungsforschung. Beiheft, 15, 92-104. Ly, K. A., Milgrom, P., & Rothen, M. (2006). Xylitol, sweeteners, and dental caries. Pediatric dentistry, 28(2), 154-163. Milgrom, P., Ly, K. A., Roberts, M. C., Rothen, M., Mueller, G., & Yamaguchi, D. K. (2006). Mutans streptococci dose response to xylitol chewing gum. Journal of dental research, 85(2), 177-181. Alanen, P., Holsti, M. L., & Pienihäkkinen, K. (2000). Sealants and xylitol chewing gum are equal in caries prevention. Acta Odontologica Scandinavica, 58(6), 279-284. Ly, K. A., Milgrom, P., & Rothen, M. (2008). The potential of dental-protective chewing gum in oral health interventions. The Journal of the American Dental Association, 139(5), 553-563. Autio, J. T. (2002). Effect of xylitol chewing gum on salivary Streptococcus mutans in preschool children. Journal of dentistry for children, 69(1), 81-86. Autio, J. T., & Courts, F. J. (2001). 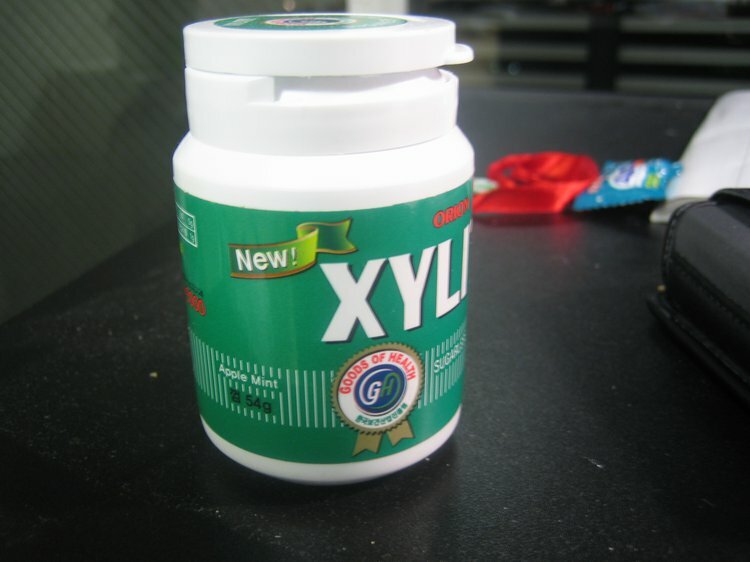 Acceptance of the xylitol chewing gum regimen by preschool children and teachers in a Head Start program: a pilot study. Pediatric dentistry, 23(1), 71-74.